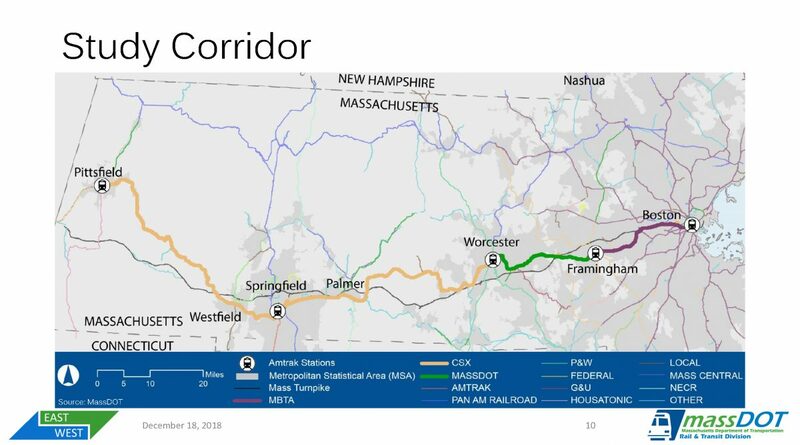 The Massachusetts Department of Transportation (MassDOT) hosted the first meeting of the East-West Rail Study Advisory Committee on December 18, 2018 at the offices of the Pioneer Valley Planning Commission in Springfield. Of particular note was the unexpected attendance of Secretary of Transportation Stephanie Pollack, who activly participated in the discussion. CSX Transportation, the owner of the rail corridor between Pittsfield and Worcester, was not present at the meeting. They had been included on the original roster of advisory committee members but they were dropped from the list before the first meeting for unknown reasons. MassDOT ran though a detailed presentation of the study and a few of the more notable slides are highlighted below. The map above details the existing rail corridor between Boston South Station and Springfield. Other rail lines are also show on this map. 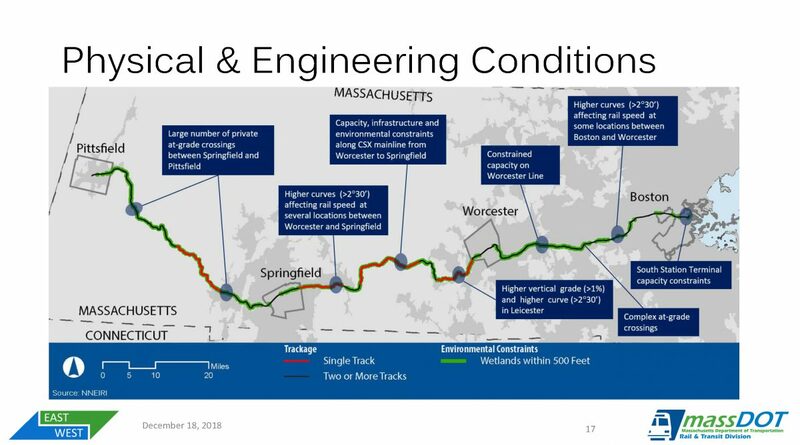 MassDOT briefly talked about some of the physical challenges that exist along the rail corridor, in particular significant curves in some locations along the line. 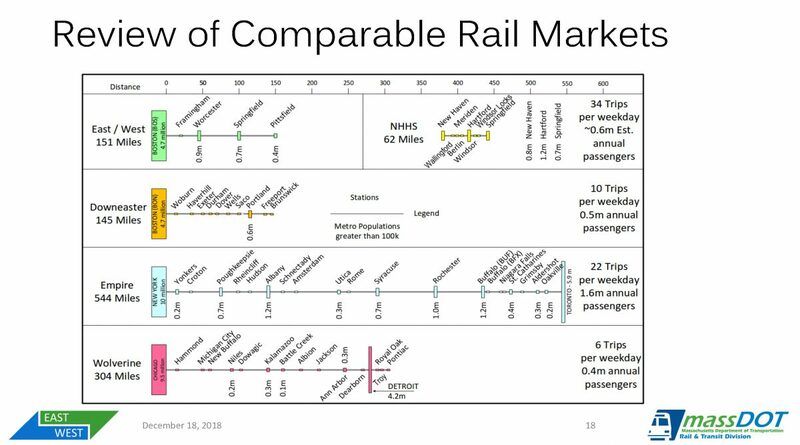 This slide details a few of the comparable passenger rail corridors in the U.S. This slide details the many related projects and studies underway in the commonwealth. Each of these efforts will affect the East-west rail study in one way or another. This interesting slide details a feedback loop that MassDOT have created for the study process. 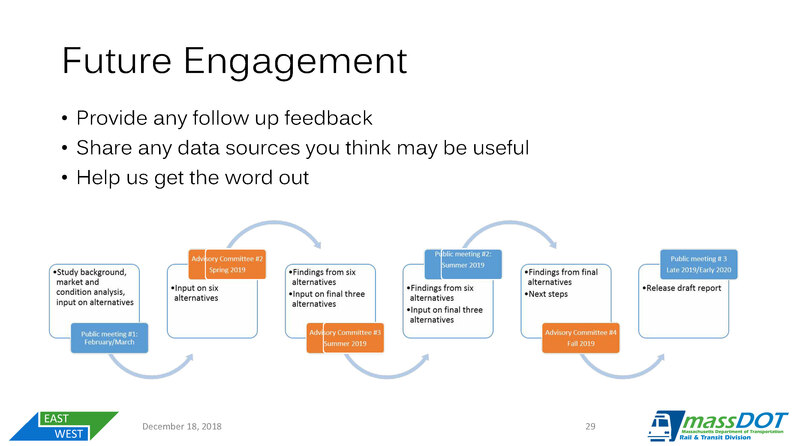 Feedback received from the each Advisory Committee meeting and Public Meeting is then used to refine the study process until the output of study is produced — which will be a draft report, which is planned to be released in late 2019/early 2020. A public meeting on the East-West Rail Study will be held in either February or March. For those who have not followed this year-long saga . . . earlier this year Amtrak had threatened to suspend all service on routes that lacked a safety technology known as Positive Train Control (PTC) by the end of December 2018. The Vermonter was under threat because the rail line between St. Albans, Vt. and Springfield, Ma. does not have PTC installed nor are there any plans to install it at this time. Over the course of the past year Amtrak conducted a safety review of the line north of Springfield and ultimatly decided to allow the Vermonter to continue running so long as certain “operational risk mitigations” were put in place to enhance safety along the rail line. How this will play out over the longer term is not clear, since PTC is in place, or will soon be in place, on the vast majority of the other rail lines in the U.S. that are used by Amtrak’s trains. Earlier this month the southbound Vermonter set an on-time departure record when the train departed from Greenfield for thirteen consecutive days. Regular riders of the southbound Vermonter know that this train has been departing consistently late from stations in western Mass. for quite some time. Most of the delays in the past were due to slow orders placed on portions of track for one reason or another. With the lifting of most slow orders on the line in Vermont the train is now able to travel at or near normal track speed on almost of the line. The credit for getting the southbound Vermonter back on schedule lies with New England Central Railroad, Amtrak and the Vermont Agency of Transportation. Thank you! And if anyone was wondering — the northbound Vermonter is also running nearly on-time most days now thanks the completion of major track work on Metro-North’s New Haven Line and the Amtrak’s Springfield–New Haven corridor. As always, we recommend that passengers boarding in Northampton, Holyoke and Greenfield (on weekends, when the Olver Transit Center isn’t open) always check the status of their train before arriving at the station — in particular to limit the amount of time standing out in the cold on the open platform in the winter. The following press released was issued in mid-December and unfortunately it received little media attention, so we are printing it here in its entirety. AMHERST, Mass. (December 12, 2018) — The University of Massachusetts Student Government Association (SGA) Senate approved a resolution and letter addressed to MassDOT and transportation secretary Stephanie Pollack, encouraging fixed fares on the Knowledge Corridor pilot passenger rail service. The SGA believes that fixed fares based on distance is the best fare structure for students and community members rather than dynamic fares that fluctuate with demand. The letter was signed by President Timothy Sullivan and approved unanimously by the body on Dec. 10. “Fixed fare structure is the way to go. For students to be able to rely on the service, they have to be able to rely on the price,” said Robert Kearns, a Student Government Association Senator and senior environmental science major. The Knowledge Corridor pilot passenger rail service is state-subsidized. The passenger rail service will run between Greenfield, Northampton, Holyoke and Springfield, Mass. — as well as Hartford and New Haven, Conn. — with connections to Metro North to New York City. There is precedent for fixed fares for passenger rail service. The Northern New England Passenger Rail Authority has set fixed fares on the state-subsidized Amtrak Downeaster service between Boston, Portland and Brunswick, Maine. CTDOT and MassDOT have agreed to fixed fares for all travel on CTrail Hartford Line between Springfield, Mass. and New Haven, Conn. Additionally, the MBTA Commuter Rail Service uses fixed fares across its network. According to the National Student Financial Wellness, approximately 70-percent of college students experience stress when it comes to finances, and 32-percent of reporting students also said they neglected their studies at least sometimes because of money owed*. One in four Americans have student loan debt** and many students cannot afford to pay high fares at peak travel times. However, they still heavily rely on public transportation to travel. Trains In The Valley applauds this advocacy effort by the UMass SGA Senate. We believe that MassDOT and CTDOT should set fixed fares for the Knowledge Corridor Pilot for all travel along the corridor between Greenfield and New Haven. 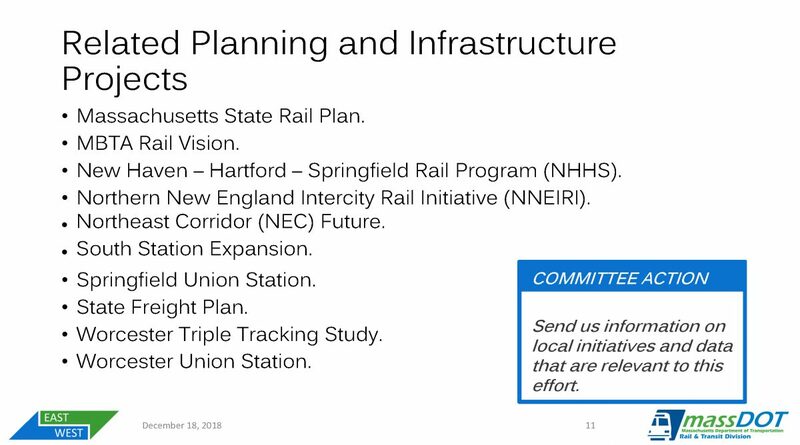 We also believe that the fares for the Knowledge Corridor Pilot service should be set at reasonable levels and logical steps above the fares that both MassDOT and CTDOT agreed to when the Hartford Line service was established in 2018. We hope to have further information on this important topic in next edition of the Rail News Roundup. As a reminder – free parking at the Olive Street Parking Garage in Greenfield ended at midnight on December 31, 2108. Paid parking is now in effect. 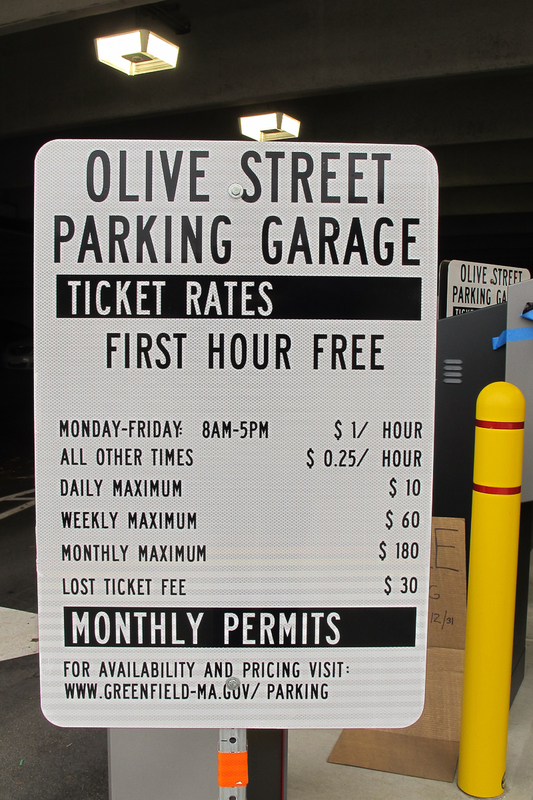 The Olive Street Parking Garage is conveniently right located across the street from the Olver Transit Center. Earlier this month CTDOT announced a short-term solution to overcrowded trains on the Hartford Line . . . limit the number of tickets available in the Amtrak reservation system (on some trains), to make room for passengers holding CTrail issued tickets. The positive effect of this change will be that for the moment all CTrail ticket holders should be able to board any Hartford Line train operated by Amtrak. The negative side of this decision is that as ridership grows Amtrak’s reservation system could start turning away passengers who would otherwise have purchased a ticket, if more seats were available on their trains. This is not an ideal solution, but it should work for the moment. At some date in the future Amtrak (or maybe CTDOT) will add coaches to the Amtrak operated trains on the Hartford Line. When this will happen we do not know, but we will be sure to tell you when it happens. The Act would direct the Massachusetts Department of Transportation to conduct a feasibility study of passenger rail service along this rail corridor. The proposed study would also examine and evaluate the costs and economic opportunities related to establishing the service. On weekdays there are currently 34 trains on the MBTA Fitchburg Commuter Rail Line that start or end their journey in Wachusett today. Could a few of these trains be extended further west? Could there be a connecting shuttle train in Wachuset for points west? In theory, yes, but there are many issues that would need to be reviewed and addressed first. 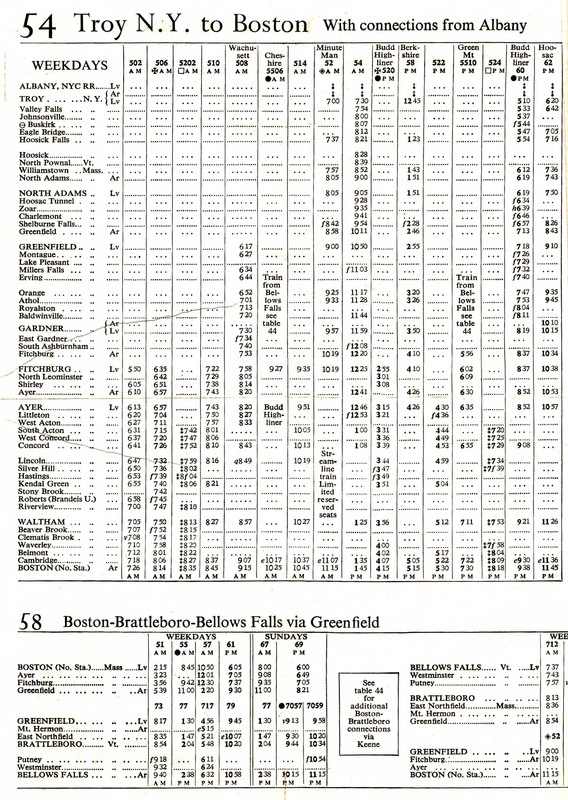 We tracked down this old Boston & Maine Railroad timetable for this line earlier this week. 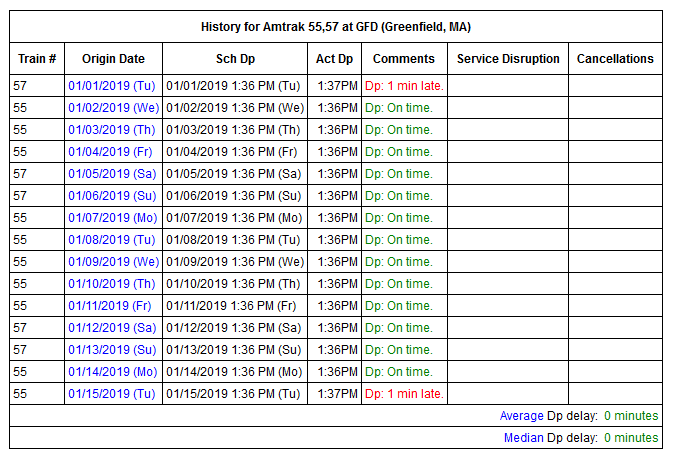 What’s interesting to see is that the fastest train from Greenfield to North Station made the run in just 2 hours and 15 minutes back in 1954., which is comparable to the time it takes Amtrak’s Downeaster to travel from North Station to Portland, Me. today. There’s a lot that could be said about this proposed study. What we will say now is that for anyone that wants to see this happen the first thing that we as a region need to do is support (and ride) the planned Knowledge Corridor Pilot rail service which should get rolling in June 2019. If East-West Passenger rail is to be operated in our state, on any line, we’re going to need to show the decision makers in Boston that people in our region actually want to sit on trains rather than in their vehicles. Crossing at Front St in West Springfield, Ma. So, we totally missed this story last October so we’re posting it here so it gets back on the radar. According to the report, long freight trains arriving from the west often block the crossing at Front Street for as long as an hour. The story details efforts by the mayors of Agawam and West Springfield, Congressman Richard Neal, State Rep. Michael Finn, and MassDOT, as they try to find solve this problem. As noted in the article, there is a Facebook page called Agawam/West Side Train Crossing – Train or No Train, with over 900 members. Members on this page alert each other on a daily basis when the crossing is blocked by a CSX train. A report from WWLP-News 22 on January 18, 2019, says that MassDOT is working on a plan to provide “early warning” signs that would automatically alert drivers when the CSX main line is blocked at the Front Street crossing. To round out this issue we offer this scene from North Hatfield. Clearly shown in the foreground is a sign, apparently new, with the words “North Hatfield.” The rail line shown is the MassDOT-owned Connecticut River Main Line. 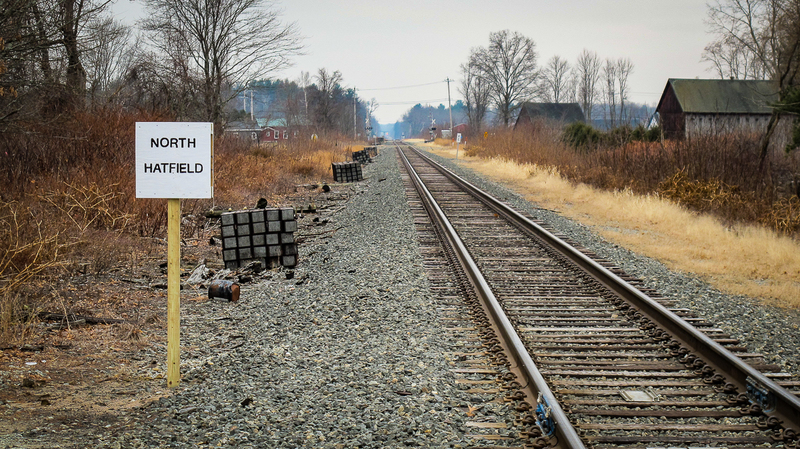 We don’t know why this sign was put up, but our guess is that its there for the crews who will soon (weather permitting) be installing the new railroad ties laying in bundles along the east side of the track. Normally they would use the milepost markers of GPS to figure out where they are working but maybe for some reason there is a need for them to know the name of the town they were working in too. If anyone has any other ideas and wants to share them please drop us a line using the contact form on the site. “North Hatfield has always been in the employee timetable. If the sign is actually new, it was just replacing a missing sign that should have still been there all along. Permits given to workers for their working limits as well as speed restrictions given to trains require the limits to be specified by a physical characteristic found in the employee timetable, such as mileposts or stations.